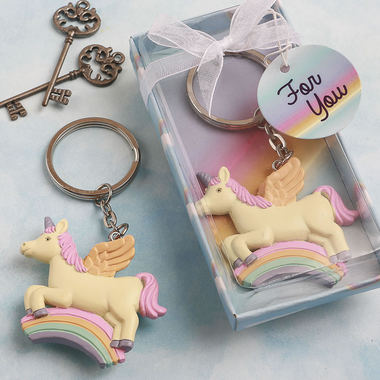 Send your guests home with a little puff of magic when you gift them mystical unicorn party favors at your fantasy theme event. Each adorable key chain is a practical favor with an ivory unicorn galloping over a rainbow, and is sure to steal the hearts of all fairytale-addicts. The hand-painted ivory unicorn is made of poly resin and is 1 7/8" x 1 7/8" in size. It has a pink mane and purple hoofs, and flies over a multicolored rainbow. With the attached silver metal chain and key ring, the overall size of the gift is 3 ?". This hot theme charm is placed within a matching rainbow design box with a blue sky and puffy clouds. The white organza ribbon wrap with bow and ?For you? tag in a round rainbow design adds the finishing touches.